Corey Christensen has taught his own brand of music and theatre to children and adults for over 15 years. Corey was born and raised in southern Oregon where he spent his youth performing live music and theatre on stages like the Ross Ragland Theatre, The Linkville Playhouse, Oregon Stage Works, and Oregon Shakespeare Festival. He has been playing the guitar and drums, as well as acting and directing, since he was 12 years old. As a teenager he created Klamath Teen Theatre in Klamath Falls, Oregon and was also guest teaching after-school programs for local elementary and middle schools. His band in high school, “4 out of 5 Dentists” won several talent shows in Klamath Falls Oregon. After High School he went on to work on movie sets as a Production Assistant in Hollywood and continued to play music up and down the West Coast. After completing his BA in Sound Design and Theatre for Youth at The Evergreen State College, Corey worked for the Oregon Shakespeare Festival, Ashland Children’s Theatre and ran his own puppetry company “steppuP Puppets”. He has also worked for The Helen Hayes Theatre Awards in Washington DC, Blue Sky Puppet Theatre in Maryland, and Perry-Mansfield Performing Arts School and Camp in Steamboat Springs Colorado. While working for Blue Sky Puppets he was honored to perform for the Obama Administrations’ Children’s Inaugural Ball. Most recently Corey comes to Silverton Oregon from the Portland/Vancouver area, where he has taught music and theatre for the last 6 years at places like Musical Beginnings in Vancouver Washington and Full Life in Portland Oregon. 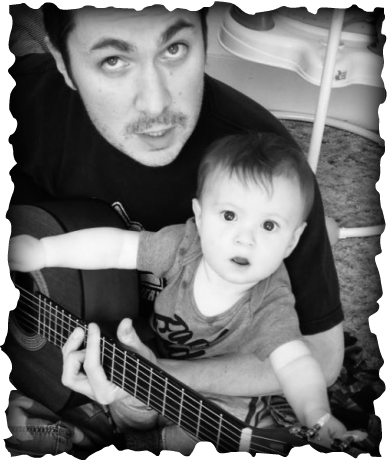 Corey believes in the power of mentoring, loves puppetry, plays the drums, guitar, bass, ukulele, banjo, and keys. Notably, his current project “The Basinbillies”, a bluegrass band, took 1st place in 2010 at the Spirit Mountain Casino “Country Ruckus” competition. Currently, Corey also currently serves on the board of directors for the Silverton Country Historical Society. Corey is a proud husband and father, he wouldn't be who he is without his wife Shana and his son Brant! Michael teaches guitar, ukulele, piano, and drums. Ray Hanna began his musical journey at the age of 9. Quickly learning to sight-read on the reeds, Ray branched out into percussion in high school and did his first singing in choirs. Realizing he couldn’t accompany himself on the sax, Ray began his lifelong exploration of the piano on his way to a degree at San Jose State. Based in San Francisco, Ray headlined comedy, cabaret and theatre venues all over the world, logging some 6000 appearances over 24 years. During the last two decades, Ray has upped his commitment to the music, and has appeared regularly with a number of working rock bands in Oregon; for the past 12 years leading the RECKLESS ROCKHOUNDS. Ray remembers, “In the comedy clubs, I was known as the ‘piano guy’. Since then, I have worked very hard at the humbling process of removing the quotation marks from piano guy." Helen Thurlow - FLUTE, SAXOPHONE, VOICE and Beginner PIANO LESSONS (Lesson Availability on Friday and Saturday for now). We are very pleased to have Helen Thurlow as part of the SoundStream Music family. She’s been playing music since she hopped on stage at a pizza parlor in California when she was 3 years old and started to sing and dance to the music. She experimented with both piano and guitar when she was a kid, not really knowing what she was doing. It wasn’t until a band class in 5th grade where she fell in love with a beautiful silver stick, she has been playing the flute ever since. This marks 38 years with Helen’s study on the flute. She grew up listening to and playing along with jazz standards. She also learned to play saxophone in the high school jazz band. She knew she wanted to perform for a living when she had her very first gig at Chinese restaurant in Gresham, Oregon. Prior to attending college she earned 4th place in the prestigious Mt. Hood Conference for Alto Sax.Helen went on to earn her Bachelor of Arts in music education from the University of Portland. Here she studied with Beverly Jacobs (1st chair flute for the Oregon Chamber Ensemble and OBT). Helen was 2nd chair under the tutelage of Georgeanne Reise with the UP orchestra. She also studied with the late Philip T. Cansler (saxophone) who really honed her skills in improvisation and jazz studies. He allowed Helen the opportunity to experiment with the tenor and baritone sax, as well as clarinet. Helen studied with the late Roger O. Doyle and Judith Sagun (choral conducting and voice). Her capstone senior recital focused on the French classics for alto saxophone and Latin jazz for flute and 4 part (SATB) choral arrangement for the concert choir.Due to lack of funding, music jobs are beginning to become scarce in the schools, so Helen has supported herself in a variety of educational fields from medicine, parks and recreation, parish level work, and coaching. During this time, she has had the pleasure of taking a class with Cliff Waits who at the time was an instructor at PCC Cascade. Here she advanced her musical chops by arranging pieces from instrumentals to vocal arrangements. Helen is still furthering her musical education. She is currently a guitar student of Corey’s! She is currently finishing a graduate degree in Theology at Mt. Angel Seminary and awaiting acceptance to Multnomah University for the MA in clinical counseling. Ed has over 25 years professional playing, recording and teaching experience on guitar and bass, he has been successfully gigging in bands since the age of 14. He can play multiple styles (rock, blues, jazz funk, folk) on guitar and bass and has been writing songs for almost forty years. Ed is a very a fun and engaging performer. Over the past 25 years he has taught hundreds of students from ages 6 to 60 on guitar and bass. Ed aims to provide a fun relaxed atmosphere for each student that fosters learning and growth. Can play and teach all the rhythm section instruments (guitar, bass, drums, vocals). In addition to his amazing music instruction Ed also wrote, produced and directed his own short film “Deadbeat” about a band in addition to composing all the music in his film!